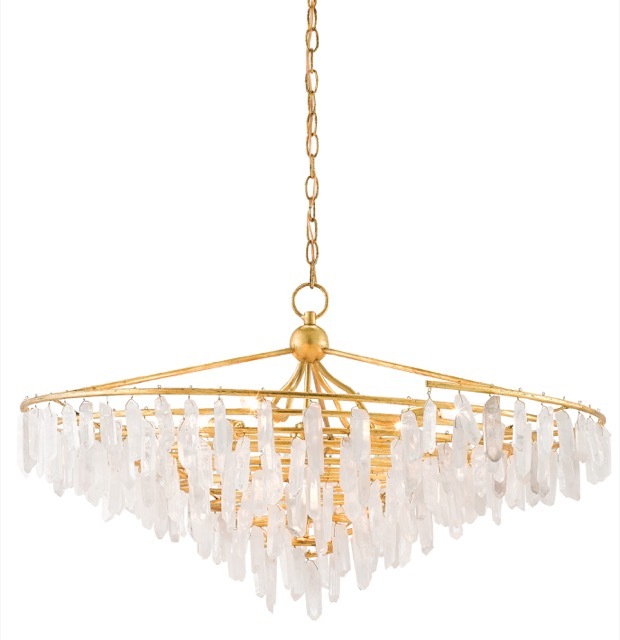 The Currey & Company Tempest Chandelier with its icicles hung in a spiral pattern will debut during High Point Market. As I was interviewing the super talented people who will be featured in this blog post, an awareness emerged: many of the new products being released and the events taking place in the showroom during High Point Market, which kicks off this week, have a pattern to them. Some of these carry the meaning you might expect—ours is a design-centric world, after all—while some are a bit more surprising in ways. Let’s dive right in, shall we? 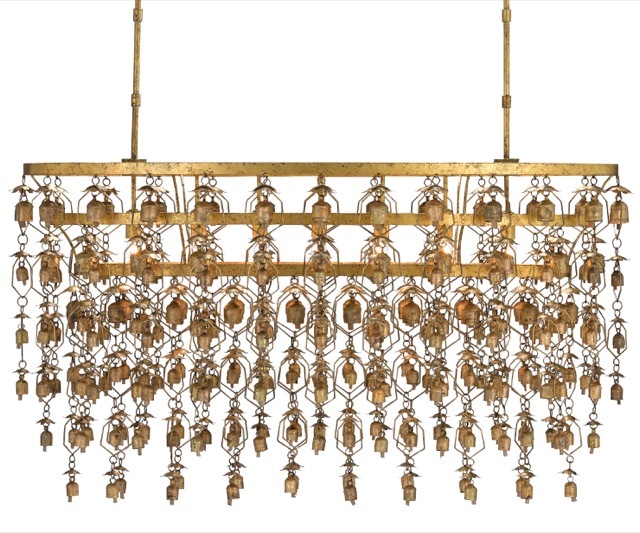 The Shanti chandelier is proof that Currey & Company speaks a pattern language fluently! In the book A Pattern Language, the group of lauded architects who authored it write, “no pattern is an isolated entity. Each pattern can exist in the world only to the extent that is supported by other patterns: the larger patterns in which it is embedded, the patterns of the same size that surround it, and the smaller patterns which are embedded in it.” If you look around the Currey & Company showroom, there is an astounding variety of motifs showcased there, each one representing a designer’s inspiration for a product. I’m looking forward to seeing the new additions that will be debuting beginning on preview day on Friday—over 200 new products in the mix. These include the Bijoux Bois offerings in the new Jamie Beckwith Collection, products in the new Phyllis Morris Collection, added elements to the Bunny Williams Collection and the Hiroshi Koshitaka Collection, and a new environmentally friendly bulb program that makes Currey & Company’s products cleverly sustainable. 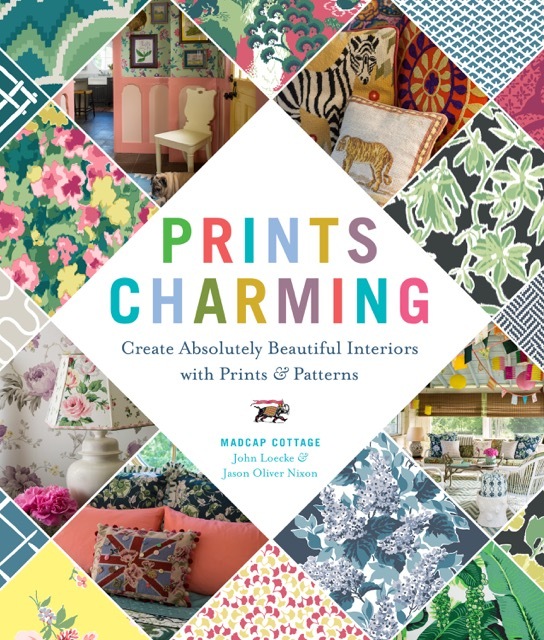 John Loecke and Jason Oliver Nixon will be signing “Prints Charming” in the Currey & Company High Point showroom. 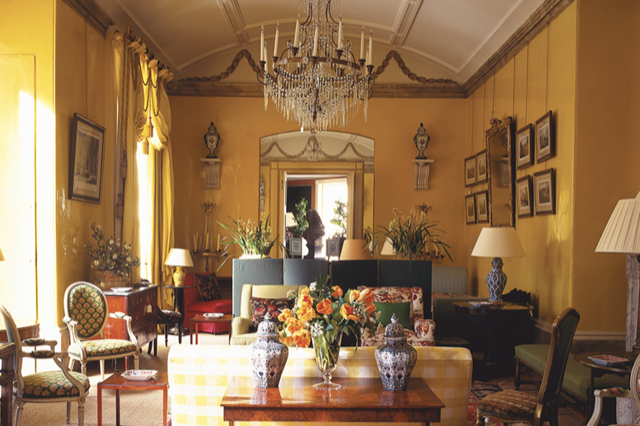 Nancy Lancaster’s Yellow Room on Brook Street in London. “Every time we go to London, we make it a point to visit because the room just says everything to us: happy, sophisticated and magical,” John adds. “The patterns always feel so soothing.” The gents will be signing books on Monday, October 16, from 2 to 4 p.m. Don’t miss the chance to snag a copy, as they’ve created such a rich story with their pattern-savvy point of view. Speaking of books, Clare Jameson and Simon Barton of Potterton Books are returning with their remarkable cache of titles for sale. And another exciting opportunity to think about patterns in a different way is the Hospitality at Market Luminary Session on Sunday October 15 from 3 to 5 p.m. Marilyn Lasecki, the senior interior design manager for luxury brands for Global Design Americas, and Stacey Tiveron, the founder of TODL.com (now Steelyard), will discuss experiences and insights that Marilyn has enjoyed through some of the most important projects in the hospitality industry. Few types of projects involve more patterns than hotels, and I’m not referencing the wallpaper and carpeting! What do you think your travel habits would say about you? Currey & Company brings Tala LEDs to America. We’ve dubbed preview day, which is Friday, October 13, Sustainable Day, as we have several events planned around this theme. Come for lunch when we’ll be serving organic dishes made with fresh produce from Robert and Suzanne Currey’s Elm Street Gardens. Stay from 2 to 4 p.m. when we will welcome the Sustainable Furnishings Council and debut the Tala Bulb Program through which we will offer LED bulbs for our lighting that will make our products cleverly sustainable. During the event, you can learn from the experts about sustainability and support the SFC with a membership/donation. It’s such an important non-profit educational organization in our industry and we’re thrilled to be hosting them. 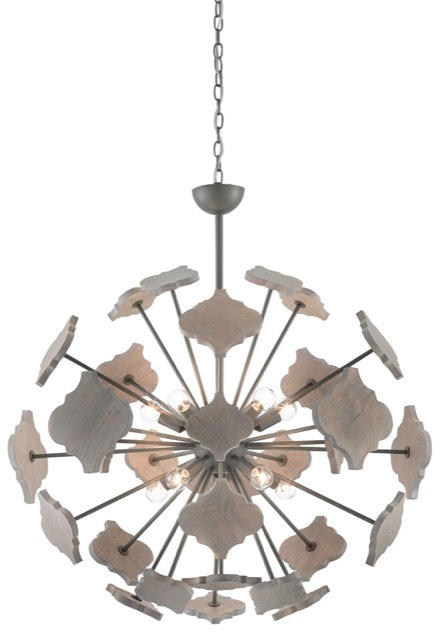 The Currey & Company Ogee Orb chandelier will debut during High Point Market. As noted above, among our new product offerings is Jamie Beckwith’s lighting line. I asked her about her fascination with patterns and she told me, “So much of what I do involves shapes and patterns, and I am drawn to them. My eye and brain just seem to gravitate to recurring motifs. What was so exciting about designing the collection for Currey & Company is that I was able to take the shapes I normally work with and see them expand into three dimensions.” Among these three-dimensional representations of her work, a standout is the Ogee Orb chandelier fashioned from wrought iron in a Hiroshi gray finish and white oak in a driftwood gray finish. The Currey & Company Hollywood table lamp will debut during High Point Market. We featured the new collaboration with Phyllis Morris’ daughter Jamie Adler on the blog last month so click through if you missed it. An example of the products, which have plenty of panache, debuting in this collection is the Hollywood table lamp with its mid-century modern pattern. What better example of how motifs are identifiable as defining entire eras of style than this beauty? Made of poplar and rubber woods that have been treated to an intermingling of contemporary gold leaf and painted black finishes, the lamp is a classic that I predict will become a classic all over again! 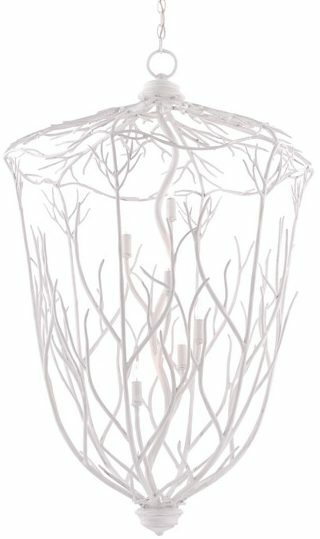 The Currey & Company Wyn wall sconce will debut during High Point Market. Like a flame exploding from a torch, the patterns on the backplate of the Wyn wall sconce reflect all the glory of the Renaissance. The way the designer, Bunny Williams, has juxtaposed gilt bronze and satin black finishes illustrates her measured eye for classical detailing. This is one of the new fixtures in her collection being introduced this market. 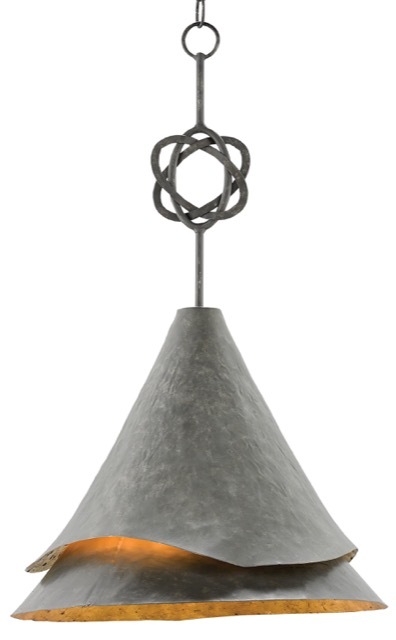 The Currey & Company Hanausububi pendant will debut during High Point Market. Designing in the Japanese traditions from which he springs, Hiroshi Koshitaka was thinking of flower knots when he created the Hanausububi pendant from wrought iron. The fluttering sheets of metal that make up the shade do seem to be unfurling into blossoms emitting warm light, don’t you think? You’ll see this lovely light fixture for the first time this market. Hiroshi is one of our designers for whom nature is a constant source of inspiration, his intimate understanding of elemental patterns informing his designs. The three patterns occurring in nature that are featured in the video below are among those he explores—branches, spirals and layers—as is the case for many of the designers who create our products. I’ve filled this post with representations of these from Currey & Company’s new product offerings, and I thought this would be an excellent opportunity to share a few powerful lines by the poet William Blake, which I feel speak to how powerful motifs gleaned from nature can be. 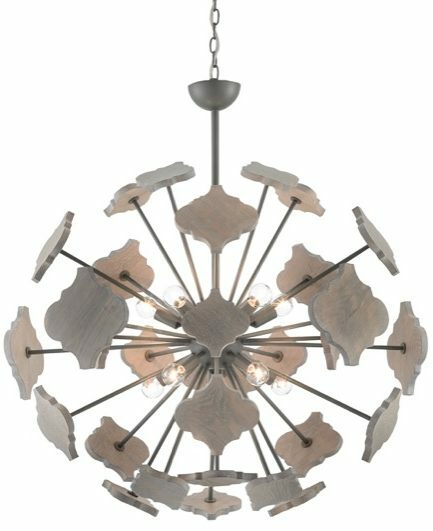 The Currey & Company Burdock chandelier will debut during High Point Market. 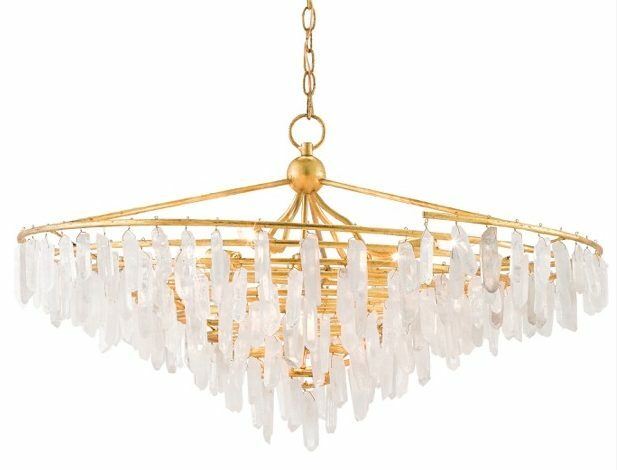 The Currey & Company Crystal Bouquet chandelier will debut during High Point Market. 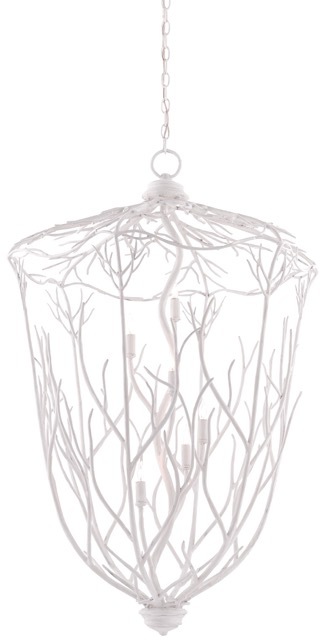 Take the new Crystal Bouquet chandelier as a concrete example: don’t you think it dangles its gathered scrim of delicate stems dripping with luminous crystals in a heavenly manner? I can’t wait to see it and all of the other new products in person. I hope to see you all there as well. Stop by IHFC M110 on Main Street and say hello even if you can’t make it to any of the terrific events. The festivities, which will be ongoing between October 13th and 18th, last all day long and into the evening. Saxon Henry is a content strategist and The Modern Salonnière. This entry was posted in Currey & Company, Market, Products and tagged black, book signing, Chandeliers, design influencers, design trends, Floral, Gold, Gray, Lighting, Mid-Century, Modern, organic shapes, Silver, Table Lamp, Wall Sconce, White on October 11, 2017 by Saxon Henry.